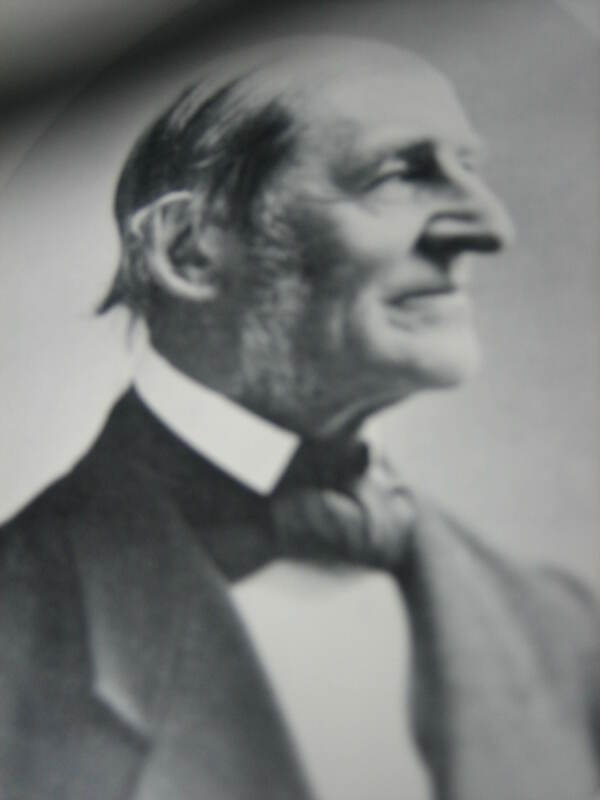 Are you familiar with the life and work of Ralph Waldo Emerson? I met Emerson some years ago when I lived in Boston. Because I’ve always loved old houses and historic towns I spent a lot of time in Concord where Emerson lived. Concord is a charming town just outside of Boston proper. I’d pop over to Emerson’s house often, stroll through his rooms, look over his books – why I even was in his bedroom many times where I saw quite a few of his personal things, like the actual dressing gown he wore most evenings. 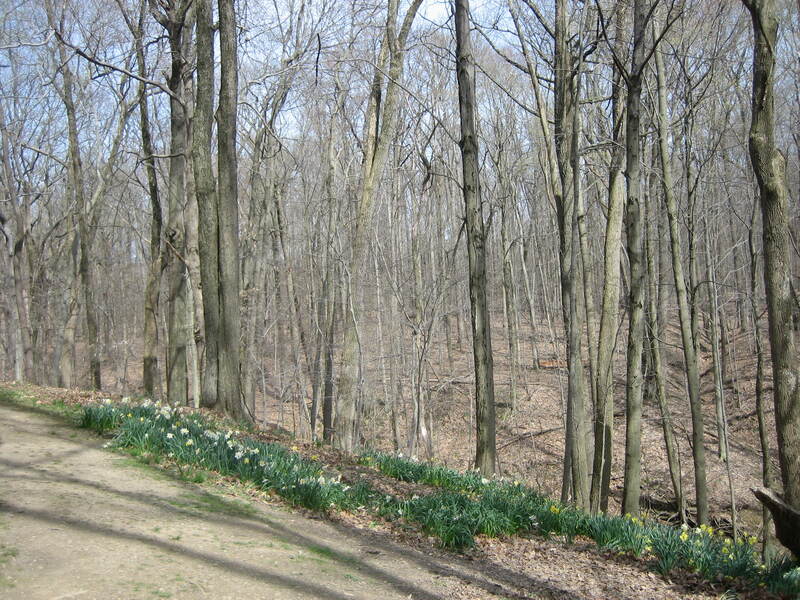 I’d walk around his garden and spend time with him, pondering his shrewd observations and penetrating perceptions. Now you may wonder how I could do that. After all, Emerson was born in 1803 and I’m not 210 years old as Emerson is. Well, if you know me at all you know I have lots of friends – some local, some letter friends far away, some living and some who are what I call “dead friends”. “Dead friends” are people from the past who I get to know through their writings, accomplishments and other work. Emerson is one of those “dead friends”. Emerson was not only a fine and popular lecturer in his day, but lucky for us he was also a writer, capturing his thoughts on paper. It’s so important we all do this, write, or how will people of the future know we ever existed, not yet understand what we were all about? We should all keep journals and write letters. I write one letter every morning. This morning’s letter went to my good friend Evelyna. 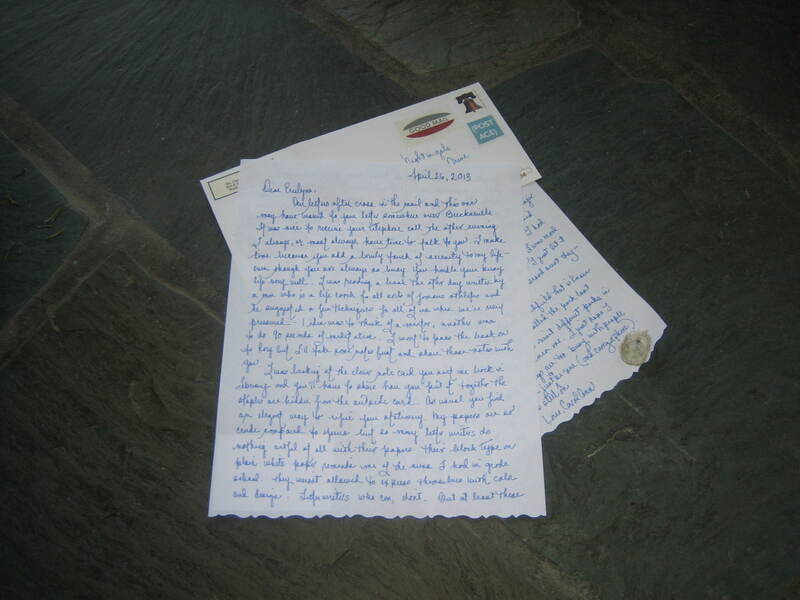 Though Evelyna lives nearby allowing us the pleasure of in-person get-togethers our letters provide us with extra opportunities to share, and this sharing is lasting. My great grandchildren will be able to get to know me and my friendship with Evelyna some day thanks to those letters – just as I have gotten to know Emerson thanks to his writing. A walk in nature can refresh us like nothing else. 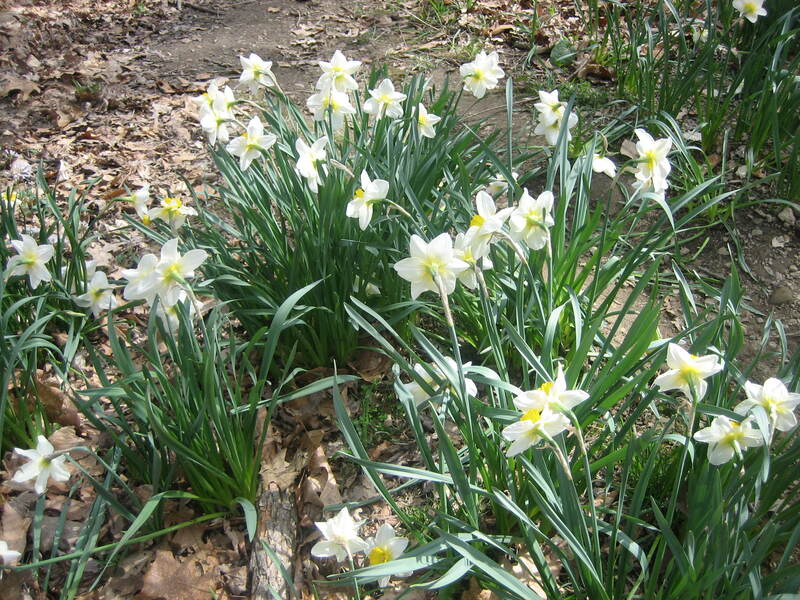 To focus on the details we see, like a patch of pretty daffodils… improves us somehow. Instruction can be had at tea time too. If I pull up a chair, open a book ( maybe one of Emerson’s books) light a candle and pour a cup of tea, new ideas come forth. So many ideas – for so many wonderful “dead friends” are there for us to enjoy. They have so much to share with us. 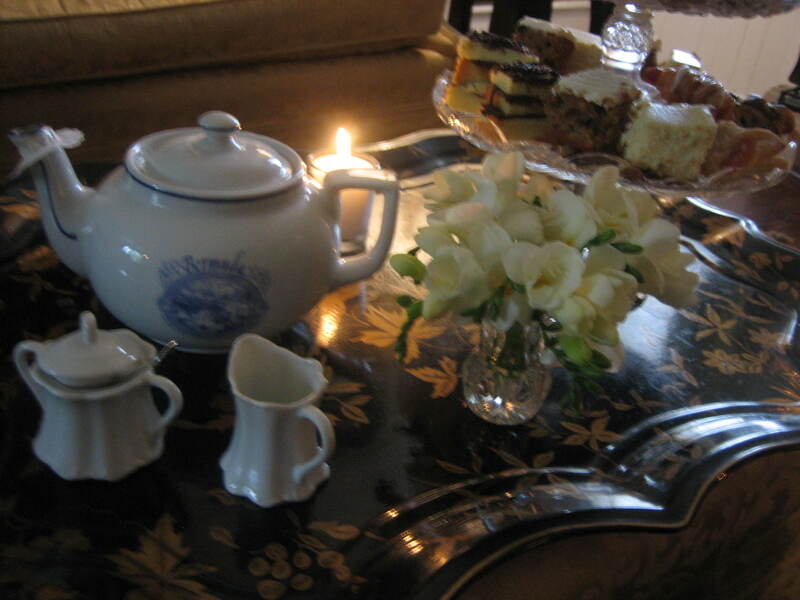 But living, breathing friends make wonderful tea guests too, sharing their ideas. I prepare a tray of goodies, invite a friend or two, and we take a break from our busy lives. Just as a stroll through nature can relax and refresh, so too can in-person sharing , especially if the setting is calm and peaceful. 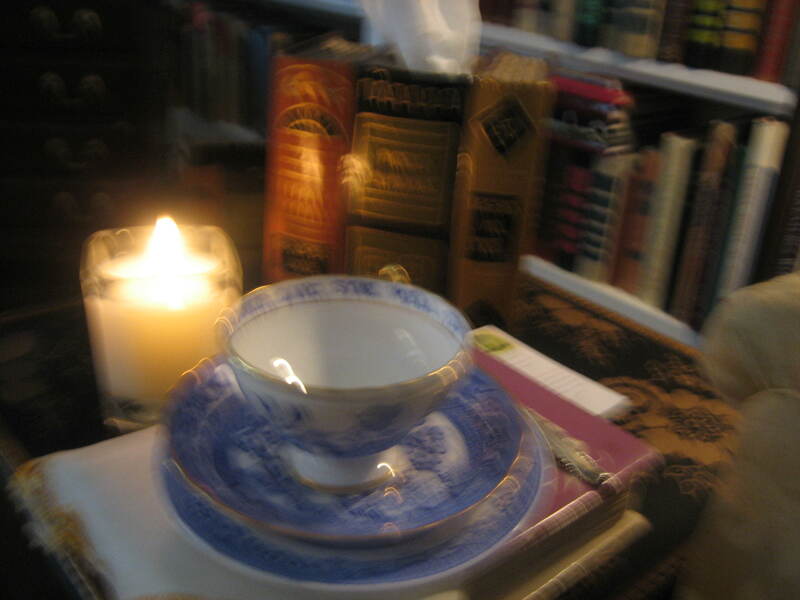 I was pleased that the day of my last tea was cool and rainy for I was able to light a fire and fill the room with the twinkle of candlelight. In this setting time seemed to slow down and my friends and I could enjoy each other’s company – talk of our current interests and inspire each other with our joys. 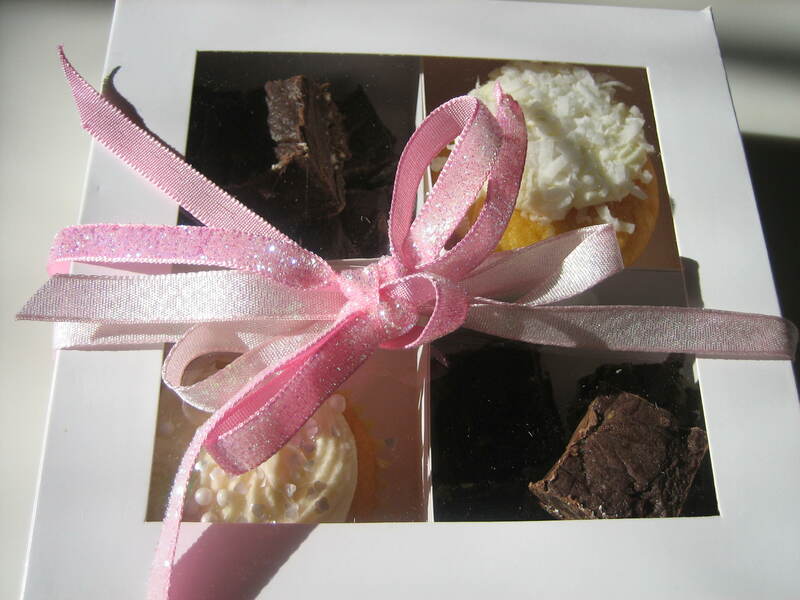 Joni spoke of her love of baking, and in fact she brought me a beautiful box of her homemade cupcakes and fudge. She’s such a wonderful friend and such a culinary artist, not only whipping up luscious goodies in her kitchen, but packaging them so beautifully and sharing them with others – others like ME! My other guest was someone new to me, Mary. 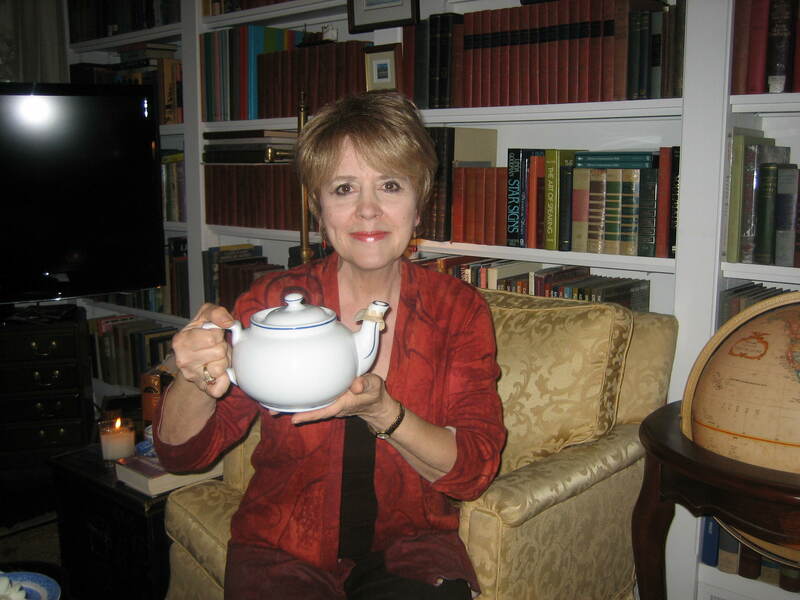 I love to invite new people to tea, people I like but don’t know very well – YET! Tea can help transform acquaintances into friends and who doesn’t enjoy having lots of wonderful friends? Mary spoke of her love for tennis and her work for our community foundation. 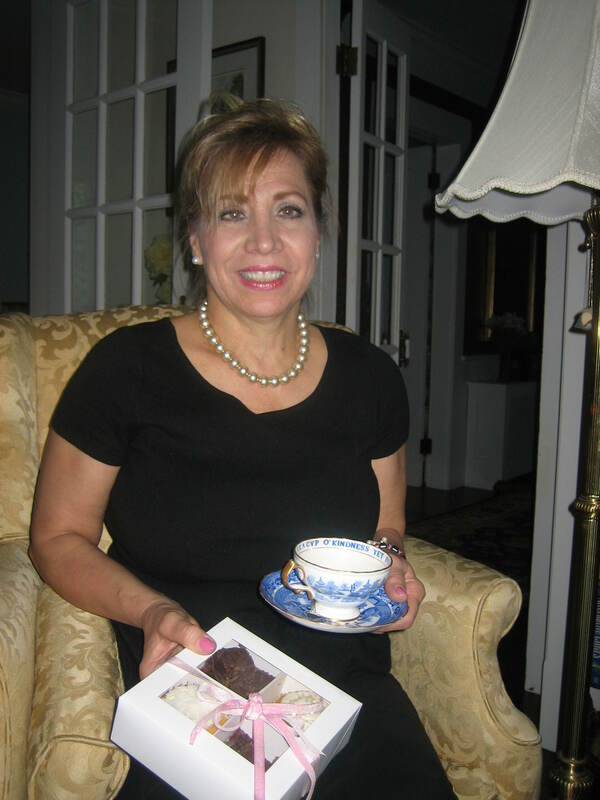 She was a lovely guest – and not only because she also brought me homemade goodies, goodies that she baked just for me. Sweet, sweet, sweet! 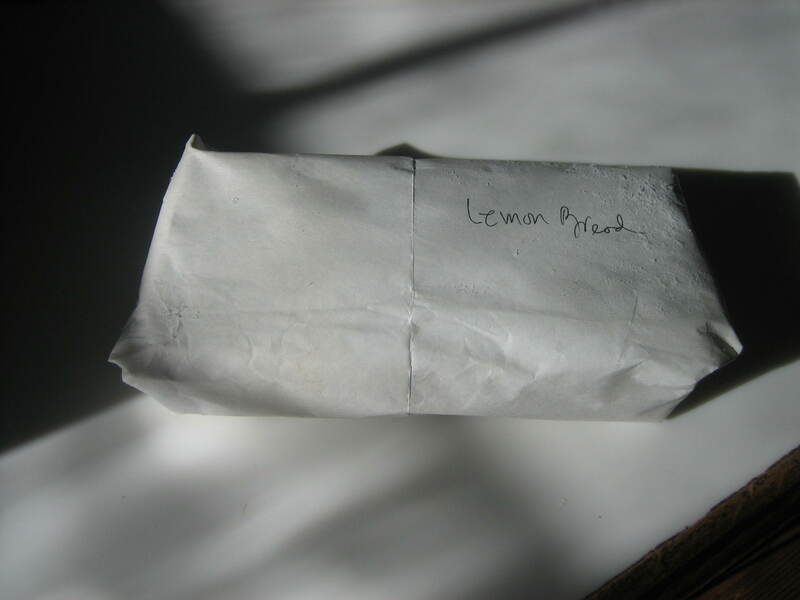 Mary gave me lemon bread which I promptly wrapped in freezer paper so it will be fresh and ready for Sunday brunch. Yum! Oh to know ladies who have domestic skill and a generous spirit. Another “dead friend” , Robert Louis Stevenson, said “The world is so full of a number of things I think we should all be as happy as kings”. I’m happy. You happy? There’s tea. There’s nature. There are new, old, living and “dead friends to keep us company… and there’s so much more. I hope you are focusing on all that good, and I hope you’re sharing your joy. Why? You know. I enjoyed every “piece” of your post. 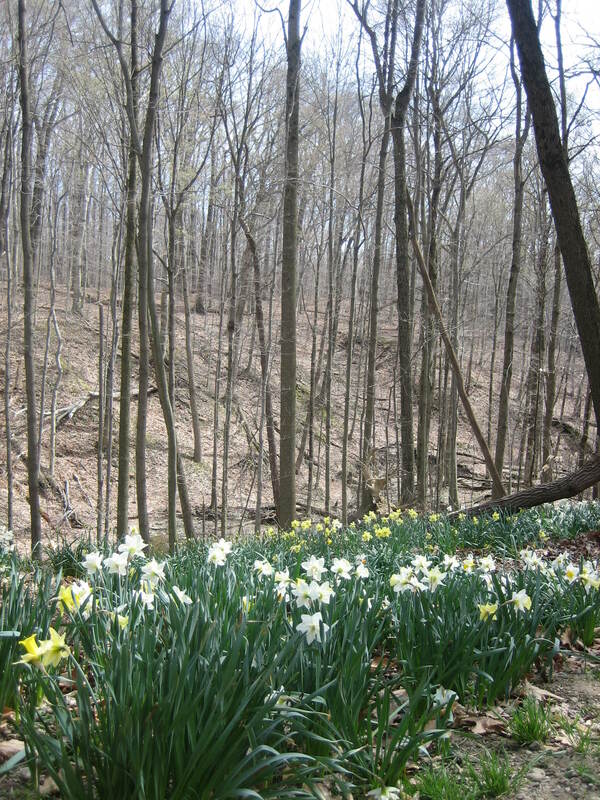 I have also been so enjoying nature with all the spring blooms bursting open. A few recent teas have have been very calming and a chance to enjoy friendships. . .
I’m so glad you stop by my blog. You are a kindred spirit in so many ways. Yes, today is a gorgeous day here in Hudson. I wish I could work in the garden, but the house needs cleaning and the supermarket needs visiting and my Rory is coming to dinner tonight so extra time must be spent in the kitchen. And you? 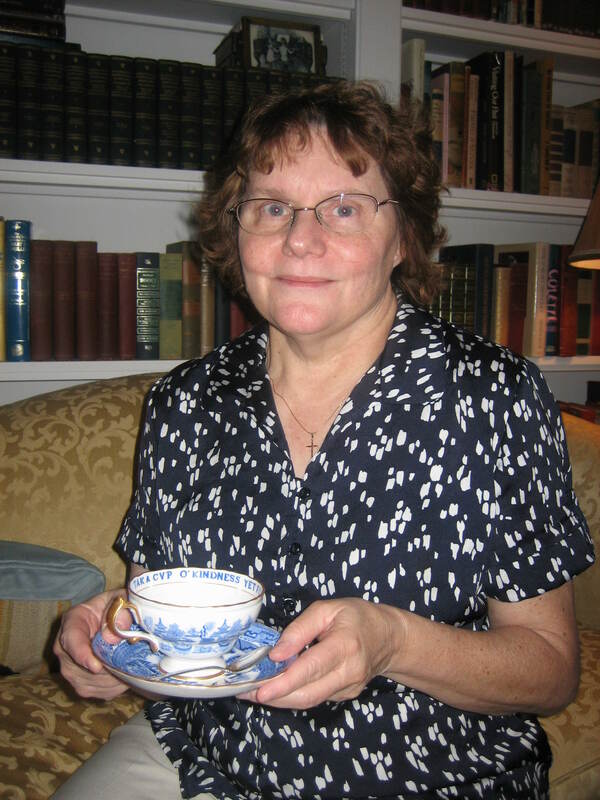 Beautiful thoughts and lovely pictures; thank you for sharing your passion for letters, tea, and friendship! Is that 3rd picture of your sitting room? It looks so welcoming. Thank you for your kind message. 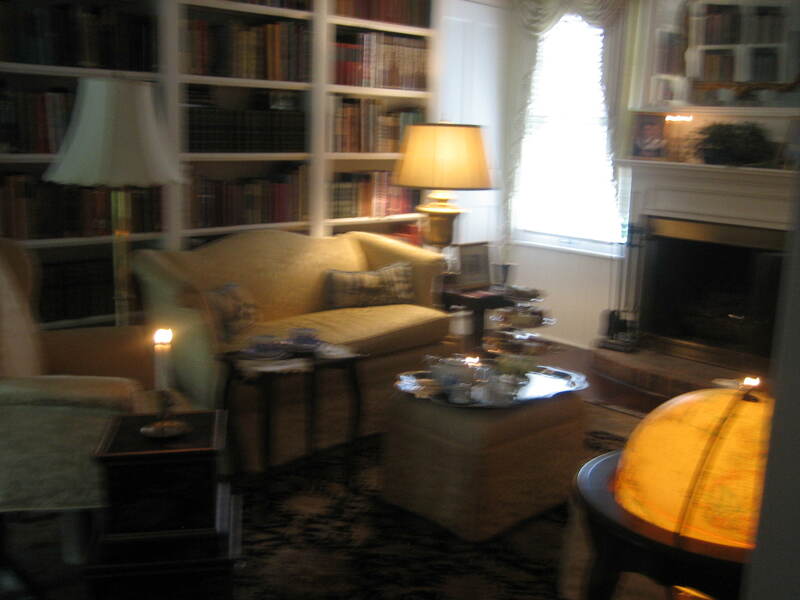 The room where I served tea that day is what I call my library because we installed two walls of floor to ceiling bookcases there.It’s a good place to read or to serve tea to guests especially on dark, rainy days. Wish you could join me there some time.